موج پیوستگی به “عملیات کراتمندی” ارتش ملی برهبری ژنرال حفتر همچنان قدرت میگیرد. فرمانده نیروی هوایی، جمعه الابانی، بسیار واحد های دولتی و اداری، نماینده لیبی در سازمان ملل، وزیر فرهنگ و یک واحد میلیشیا بنام یکان دوم امنیتی و حمایت از میهن، ( The Second Security Battalion for the Protection of the Homeland)، نیز پشتیابنی و پیوستتن خود را به ژنرال حفتر اعلام داشتند. بسیاری شوراهای محلی با اعلام بیانیه، همبستگی خود را با عملیات ضد تروریستی ژنرال حفتر اعلام کرده اند. بخشهای متعددی از واحد اطلاعاتی ارتش نیز به حفتر پیوسته و اعلام همبستگی کرده اند. علی زیدان رئیس جمهور پیشین که با رأی اسلامیستهای کنگره ملی معزول شد و درخارج بسر میبرد ضمن اعلام پشتیبانی از ژنرال حفتر از مردم لیبی خواست تا در پیکار با تروریسم به او بپیوندند. .. . خلاصه ترجمه گزارش خبری لیبی هرالد. بنظر من سرنوشت اسلامگرایان لیبی از سرنوشت اخوان المسلمین مصر بدتر خواهد بود. The movement “Operation Dignity,” launched on Friday in Benghazi by General Khalifa Hafter which claims it wants to “cleanse” the country of terrorists armed groups – and also to remove a the General National Congress (GNC) and the government – appears to be attracting growing support. A steady flow of key figures, military units, state institutions and town councils have come out in favour, despite the operation being condemned by the government as an “attempted coup” and orders being issued for the arrest of Hafter. One of the most prominent so far to back him is Libya’s ambassador to the UN, Ibrahim Dabbashi. He has declared his support in a statement posted on his official Facebook page. Reports that both Culture Minister Habib Al-Amin and the acting Interior Minister, Salah Mazigh, also came out in support have since been denied. The head of Libya’s Air Defence Juma Al-Abani announced yesterday that the division was backing Operation Dignity. Shortly afterwards, its Tripoli headquarters was targeted late last night in an attack by heavy weaons. The Second Security Battalion for the Protection of the Homeland, stationed in southern Libya, declared that it would “wholly join, with weapons and armaments, the National Army under the command of General Khalifa Belgasim Haftar.” The group added that it was “ready to carry out any commands to protect the country and its people”. Haftar also now has the official backing of Benghazi’s Special Forces, several branches of the Libyan military intelligence, as well as, reportedly, the Benghazi Navy. Other forces that have declared support include those in the Jebel Nafusa and the Jebel Al-Akhdar. Several local councils have released official statements pledging their full support of the movement, including Kufra Local Council. Former prime minister Ali Zeidan, who has been living in Europe since he was ousted on a vote of no confidence by the GNC , has also backed General Haftar, calling on all Libyans to “support the army’s war on terrorism”. There also appears to be a wave of popular support on the street for Hafter. The talk in Tripoli coffee bars, a barometer of public opinion, at least in the capital, in firmly in favour of the renegade general. By Callum Paton, Ashraf Abdul Wahab and Taher Zaroog. The Libyan Government has called on armed groups – namely Libya Central Shield, Qaaqaa and Sawaiq brigades – to leave Tripoli as the brigades squared up in the capital this evening. Members of the Misratan-based Libya Central Shield arrived on the outskirts of Tripoli today, stationing themselves in the Salaheddin district, where clashes took place in the early hours of yesterday morning. It is not clear how many Shield troops have arrived in Tripoli but estimates range upwards from several hundred. The government ordered Libya Central Shield, Qaaqaa and Sawaiq brigades to withdraw from the city on the grounds that their presence threatened the lives of residents and has kept them in a state of fear for the past two days. It added that the current atmosphere of political sabre-rattling threatened the country, and the existence of multiple forces on the ground could result in serious losses. 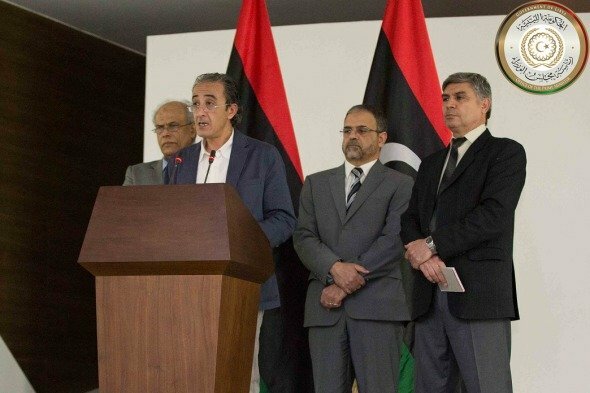 It said it would hold the General National Congress (GNC) responsible for any of Libya Central Shield’s actions, because Congress head Nuri Abu Sahmain had called on them to protect the capital. All political forces in country should unite and bear responsibility for the current national crisis, the government said. In a statement released earlier today Libya Central Shield said it had come to Tripoli as a neutral force, with no allegiance to either the GNC or the government. The sole purpose of its presence in the capital was to protect institutions and civilians, it said, adding that it was ready to facilitate a national dialogue between all conflicting parties. The Government also asked the GNC to show its willingness to hold prompt elections, saying these should take place no later than a month from today. It also voiced frustration that Congress had not responded to its demands to hold a second round of elections to elect a Prime Minister, pass a budget and then cease its activities. The streets of Tripoli were quiet, but not deserted this evening, with some shops and businesses closing early.